In my most recent review here on Lambda Literary, I considered the late Eve Kosofsky Sedgwick’s posthumous book The Weather in Proust and mourned the loss of one of our greatest queer scholars. 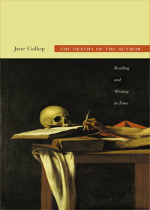 In hindsight, I wish I had come across Jane Gallop’s latest book The Deaths of the Author (Duke University Press) beforehand, because Gallop meticulously yet gracefully analyzes the complicated relationship between a devoted reader and the author that inspires them. After reading these essays on Jacques Derrida’s memorial to Roland Barthes, Sedgwick’s elegies for two writers dying of AIDS, and Gayatri Spivak’s writing before the specter of Karl Marx, Gallop has given me a new language with which to speak about the passing of queer writers. Amid the political turmoil and cultural revolutions of the late 60s, two gay French philosophers, Roland Barthes and Michel Foucault, forever changed the study of literature by proclaiming the death of the author. Much like Nietzsche’s announcement that “God is dead,” Barthes’ statement sought to demystify the “author-god” as a social construction and to emphasize the reader’s own interpretive powers. Gallop uses this statement as an inspiration to consider not just the figurative death of the author once we view him as a mere conduit of tradition and culture but also the literal death of an author when we are forced to reconcile the real life of the person with the literary persona they left behind.